The name Pondicherry,immediately flashes Aurobindo Ashram and Auroville in my mind. I feel blessed to have visited the ashram twice and auroville once. The experience of visiting Mantri Mandir is still fresh in my mind, even as i write i can feel how spiritual it was when we entered the crystall ball meditation room. So much positive energy was radiating in that room, it just comes and hits you like a wave, when you come outside, you will automatically feel so relaxed and calm. 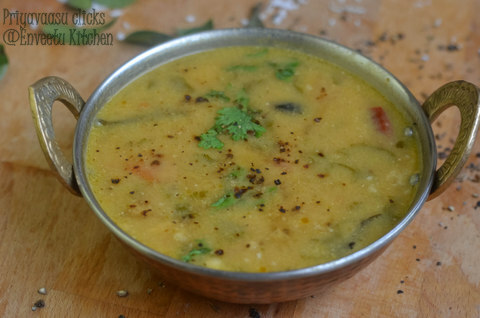 Coming to today's recipe, i chose a simple and soothing rasam recipe from the The Pondicherry Kitchen. 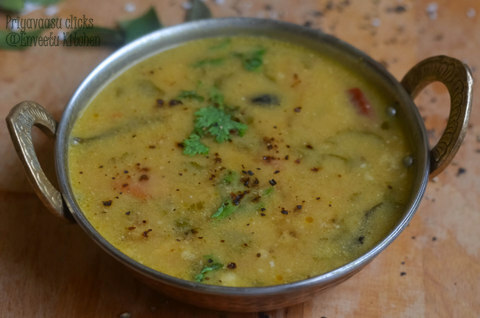 The name thengaipaal rasam was very tempting, coz we normally make rasam with dal/tamarind sometimes with fruits like plum and pineapple, but with milk, was interesting!! It was super delicious, both the kids loved the taste. Soak tamarind in 1/2 cup warm water and extract the juice, to this add crushed tomatoes. Add this to the coconut-milk & dal mixture. To this add crushed garlic and rasam powder. Stir well. Heat oil given under tempering in pan, splutter mustard seeds, crackle cumin, add broken red chilies, hing, turmeric and curry leaves. Next add the coconut-milk mixture. Reduce the flame to lowest possible. Do not allow this mixture to boil. Let this be on the heat, until it starts to froth well. In the mean time, take a serving bowl, add salt and fresh coriander leaves and keep ready. When the rasam comes to boiling stage, pour it into the bowl and cover with a lid and serve after 15 minutes. Serve hot as an accompaniment with rice. You should plan a trip when i'll be there Priya, there are so many varieties of thengapaal rasam in Pondicherry,my mom this rasam without toor dal, such a comforting food na. Definitely priya, we enjoyed it a lot!!! Is it so, do share your mom's version of this rasam pa!!! Rasam with coconut milk is different. That bowl looks creamy and appetizing. 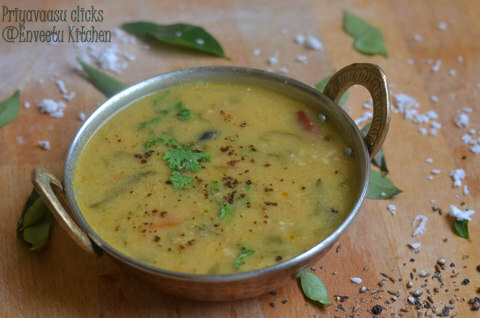 That's surely very new for me..never made rasam with coconut milk....and yes talk about visiting places with kids in tow..I would feel we need rest after a vacation..
Dal looks creamy & delicious. Wow! looks so good and inviting. Such a comforting and flavorful rasam,my aunt makes this one very frequently..love it steamed rice..
Yum. My girls love rasam so lets see...will give you the feedback.